Lately, I'm just having a hard time getting excited over bronzers, period. But that's not to say this isn't a decent one. It's pretty pigmented, yet still looks subtle on the skin. You can wear it all over for a natural-looking bronze, or because it's fairly matte, you can use it to contour, which is nice. This is such a gorgeous, natural bronzer. The color works so well with my light skin tone and blends seamlessly into skin -- no obvious bronze lines at the jaw. There is an ever so slight shimmer that just makes skin look so radiant. Really impressed with this bronzer. 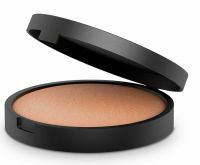 Fantastic bronzer! Goes on evenly and gives a pretty glow to my winter skin. Doesn’t feel heavy like other bronzers. Loved this product.